Whether you wish to become part of our theatre group or enjoy our shows, this is the place to find our latest information. We're so excited for our 2018-2019 season which includes It’s a Wonderful Life: A Live Radio Play, Little Women, Into the Woods, Shakespeare in the Gardens: A Midsummer Night’s Dream and Thanksgiving: A Dinner Theater Play. Be sure to check out our other pages for audition and performance dates & information. Want to get involved? Follow us on Facebook at http://www.facebook.com/outofthewoodstheatre and/or send us an e-mail at outofthewoodstheatre@hotmail.com. Nicole Stephens, manager of the new Out of the Woods Theatre troupe. Photo Courtesy of City Pages. Not many theater groups can boast they have fully reserved shows for their very first production. The newly formed Out of the Woods Theatre can. Their two dinner performances of It’s a Wonderful Life: A Live Radio Play, taking place at Thrive Foodery Dec. 5-6 are completely filled. “I can’t even promote it!” says manager Nicole Stephens. The performance is an adaptation of the movie done as a 1940s-era live radio show, complete with sound effects and fun vintage commercials. While it may be the first official performance for this new Wausau-based theatre group, the cast members are not strangers to the stage and are enthusiastic to perform. “People are obviously as excited as we are,” touts Stephens about the first show being filled. Out of the Woods Theatre began taking shape just last summer and was brought to fruition with the help of people who have been involved in other local theater groups such as Wausau Community Theatre and Central Wisconsin Children’s Theatre. Stephens herself has been involved in theater since she was a little girl, and is excited to add more acting opportunities for those in central Wisconsin. “There is such an enormous pool of talent in the area and we look forward to making our own mark in the theatre community” she says. The new troupe fills a void left by two other “alternative” local groups, Artista! Players (which specialized in dinner theater shows) and Oasis Theater Ensemble (which specialized in classical stage dramas). Both of these Wausau-based organizations performed for several years but went dormant since 2015-2016. Actors who had been involved with both those groups are now involved with Out of the Woods Theatre. They include longtime local theatre stalwarts Carol Lamansky and Jim Hawkins, both of whom are performing in It’s a Wonderful Life. Even though this first show is sold out, you’ll have plenty of other opportunities to see this group in action, as they have slated several more performances slated for their inaugural season. The two biggest shows are the Broadway musical adaptation of Little Women April 5-7 and the fairy tale musical Into the Woods in June, both to be held at the UWSP-Wausau Veninga Theatre. In addition to these large scale musicals, Out of the Woods Theatre is partnering with Monk Botanical Gardens for a summer Shakespeare event in 2019 to perform A Midsummer Night’s Dream. Preliminary talks have included three evening performances along with a special children’s matinee. The final performance scheduled for the season is a dinner theatre production in November 2019 at the Wausau Elks Lodge. The troupe is determined to be relevant in the community by varying the types of performances they do. “Not everyone loves dinner theater and not everyone loves musicals” Stephens says. By presenting a healthy mix of performances, the theatre group is able to explore more performance channels and keep the group fun and engaging. Out of the Woods Theatre is in need of volunteer directors, musical directors, assistant directors, choreographers, stage managers and crew to help with future productions. To get involved and for more information about upcoming shows and auditions visit OutOfTheWoodsTheatre.com and their Facebook page. “Five for all forever!” Left to Right: Sidney May as Amy, Deanta Saunders as Beth, Lindsey Smith as Meg, Ashlyn Lewis as Jo, and Zaden Scheer as Laurie. Photo Courtesy of Sean Caldwell. Out of the Woods recently completed it’s run of Little Women the Broadway Musical. 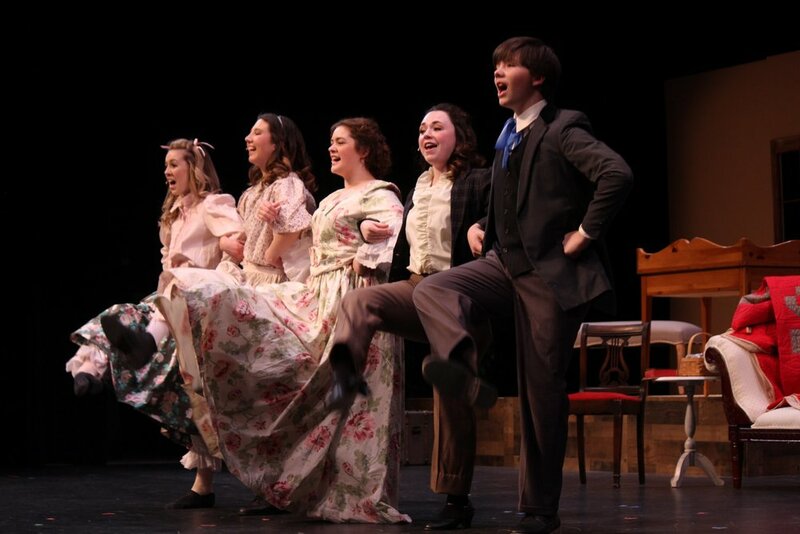 Audiences praised our heartwarming show for “perfect casting,” costumes and more. Thank you for attending our production and supporting Out of the Woods Theatre!